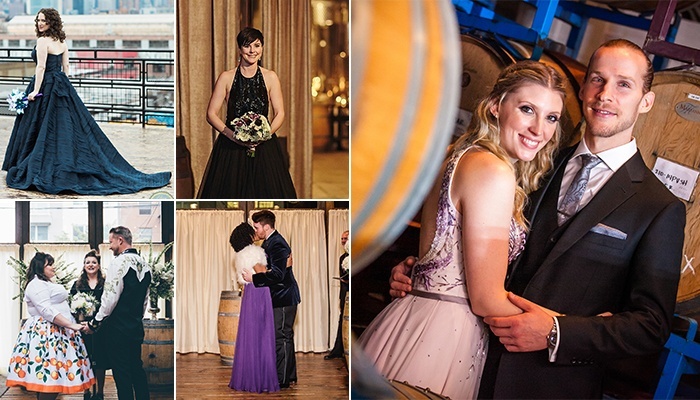 With our sales team on the phone with prospective wedding couples every day and our events team on site running weddings every weekend, the staff at Brooklyn Winery truly has an inside line on what wedding trends are coming in 2017. Some of these trends started picking up speed in 2016, and some will soon be making their first widespread debuts. In any case, this year, the trends will be everywhere. Here is a list of our Top 5 Wedding Trend Predictions for 2017! Jordan almonds are out. Shot glasses are done. More and more couples are selecting customized, meaningful favors that reflect their personality and that their guests will actually like and use. So select a memento that you love and that your guests can enjoy! Edible favors—from local, artisanal shops—are on the rise and we can see why! People are going crazy for macarons; French chic is always in. What makes macaron favors especially relevant is the increasing availability of customizable treats. We recommend Woops! for all of your macaron needs. 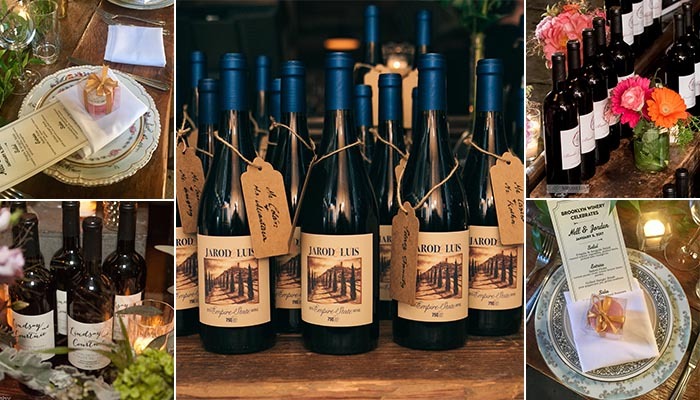 Now, we may be a bit biased, but all evidence points to the fact that wine will also top the charts as a wedding favor, with couples opting to design custom wine labels for their wine bottle favors. As with tasty treats, this is a favor that guests will undoubtedly enjoy, and one that allows everyone to remember your special day whenever they decide to crack their bottle open, whether that be the next evening or in celebration of your tenth wedding anniversary. Additionally, by holding onto a bottle yourself, you will have the perfect keepsake to enjoy down the line as you toast in remembrance of your special day. Color is coming! This year, brides are donning colors from blush to hot pink to navy blue. Your dress is a great place to let your personality shine, and with that comes color, so let the true you radiate! Colorful wedding dresses come complete with unique patterns and fun accents, ensuring there is something to fit your taste and style. Classic white will always be a beautiful, traditional choice, but expect to see the very definition of what qualifies as a wedding dress expand far and wide. Go big with florals! Floral arrangements in various, oversized forms will be the star of the show, serving as statement pieces that can show your personality as a couple. Each season presents a new opportunity for creativity. 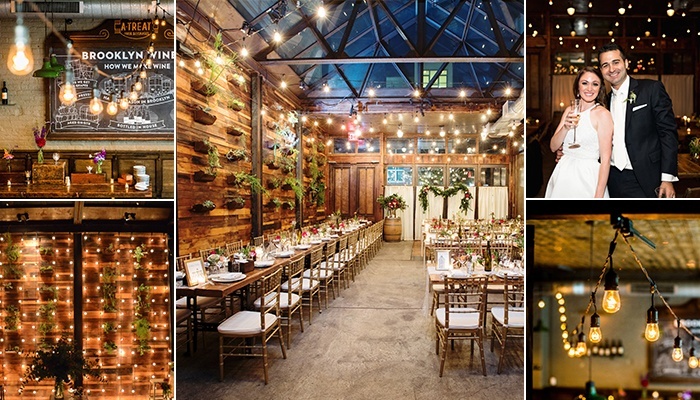 Add a hanging floral chandelier for a spring wedding. 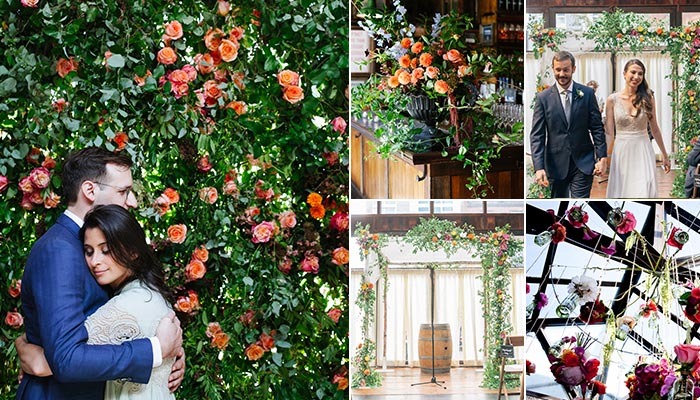 Vibrant flower walls are beautiful backdrops for a summer celebration. Fall foliage can be crafted into elaborate centerpieces, and winter, as always, will be a wonderland. This year, let your florals come to life. To design your own floral wonderland, reach out to G! Designs, Molly Oliver, or Rebecca Shepherd. String lights, pendant lamps, chandeliers, curtains of sparkling lights…twinkle is everywhere! 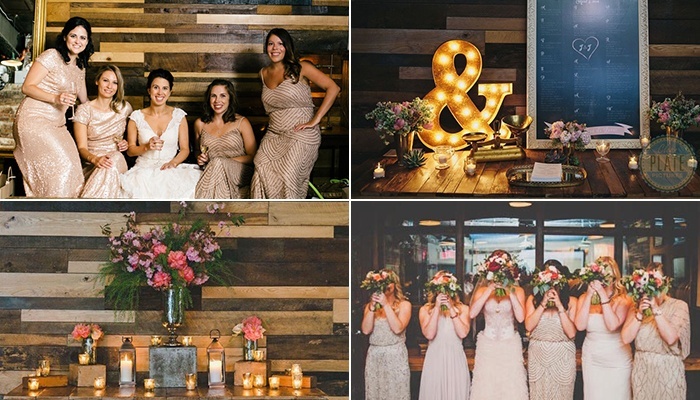 Additional lighting is the perfect way to strike the right ambience, adding a magical, warm glow to any space, and making for truly incredible photos. The great thing about incorporating decorative lighting is the fact that the cost is low and the impact is high. For the consummate professional experience, talk to Universal Light and Sound. Rose gold dresses, rose gold decor, rose gold invitations, rose gold rose gold rose gold! This chic, shiny hue is everywhere. Bridge the gap between traditional and modern by adding that romantic aura that everyone strives for, while providing just the right amount of bling factor. Little touches of rose gold here and there will go a long way and are the perfect lustrous element to bring all of your details together. 2017 is shaping up to be a year of gorgeous weddings, with great favors, stunning decor, and beautiful brides. Happy planning! 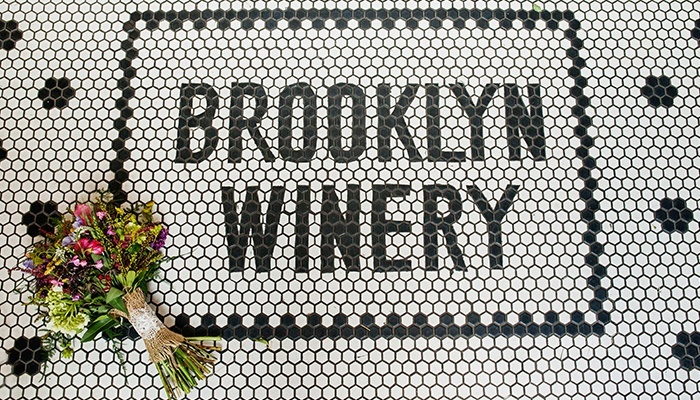 Learn more about Brooklyn Winery Weddings!